On 14th October, I watched an incredible performance. It was a glitzy, stylish Art Deco explosion worthy of a Wes Anderson movie, and shone with some truly incredible talents! 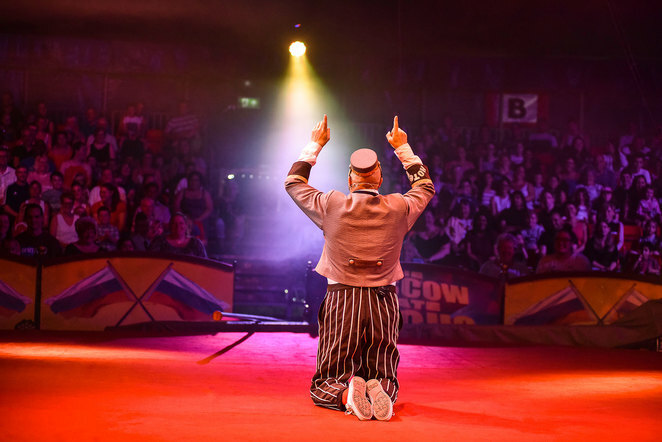 Beneath the massive yellow and red 'Big-Top' tent of the Moscow State Circus, my wife, son and I were entertained by death-defying aerial acrobatics, superb slapstick clowning and truly awesome tightrope and trapeze work. 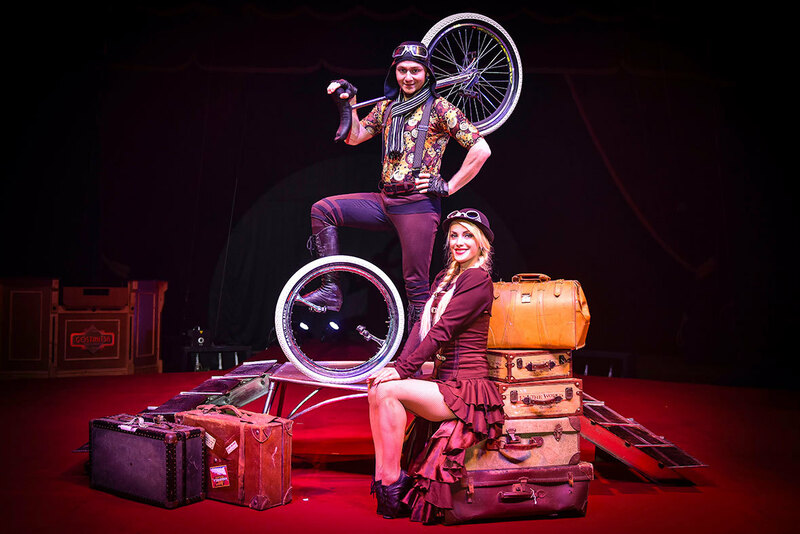 The two and a half hour show was everything that the circus should be, namely thrilling, entertaining and bursting with skill and talent. Now performing in London, this show is the best live performance that I have ever seen. The show itself tells the story of the glamorous residents of the Gostinitsa hotel. 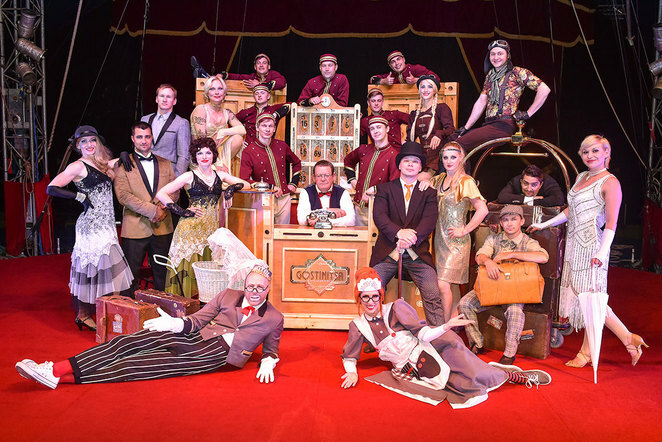 The Big-Top is the largest in the UK, and the eight different acts enter the auditorium through a staged hotel lobby. Two concierges/clowns compere the proceedings, and entertain the crowds during equipment changes. For me, it is impossible to choose a favourite part of the show, but the 'Russian Swing' routine made me feel both awe-struck and fascinated. 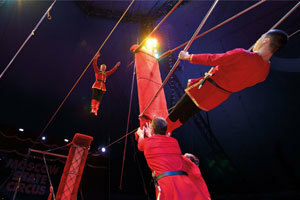 Propelled VERY HIGH into the air, with no safety harnesses, eight acrobats in traditional costumes performed flips, dives and somersaults. Taking off and landing on swinging benches, these athletes almost literally flew into the air, with grace and precision. Another wonderful performance came from a superb unicyclist duo, who leapt from saddless unicycle to unicycle, launching themselves off a ramp in the process. At one point, the gentleman of the pair jumped up onto a twelve-foot unicycle and carried his co-performer with him. Once again there was immense skill and precision on show, but performed with utter grace. One final description (I don't want to reveal all of their secrets). A beautiful and elegant part of the show consisted of tightrope walkers. 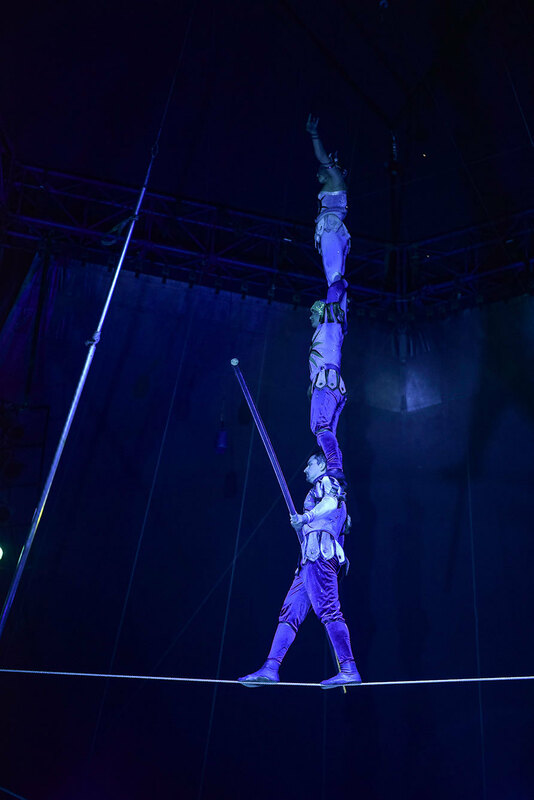 Four performers (at one point THREE PEOPLE high), traversed above viewers heads, all the time carrying glittering disco balls and each other. Watching three performers walking in unison was superb. 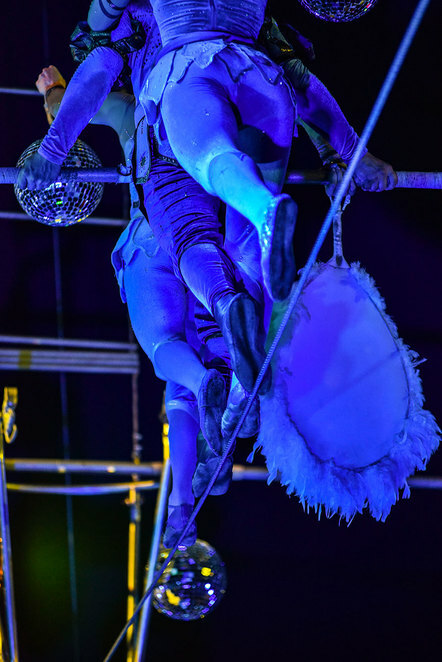 It was a lovely combination of balletic and acrobatic work. This circus has so much to be praised for. Even at grass-roots level, it was a joy to experience. Their website is easily navigable, and the mechanics of the performance ran like clockwork. With spotless and pleasant comfort facilities and a range of hot and cold food and drinks, a licenced bar and gifts, it felt like a self-contained city in miniature. The ticket prices varied in price and were not cheap, but for such an incredible experience it was brilliant value for money. If one word could sum up the show, then for me it would be 'Glamorous'. All of the performances were visually stunning, and the cast were without exception both supremely talented and extremely attractive. Taken together and adding the fact that even the tent itself is an impressive venue, I can not fault this spectacle in any way, and I would not want to. I saw audience members of every age at the performance in Bristol, and whether as toddlers or Octogenarians, all of the audience looked spellbound by the performances. The Moscow State's 'Gostinitsa' will be performing in London from 18-29th October, with further Winter dates to be announced on their website shortly. GO! You will not be disappointed.